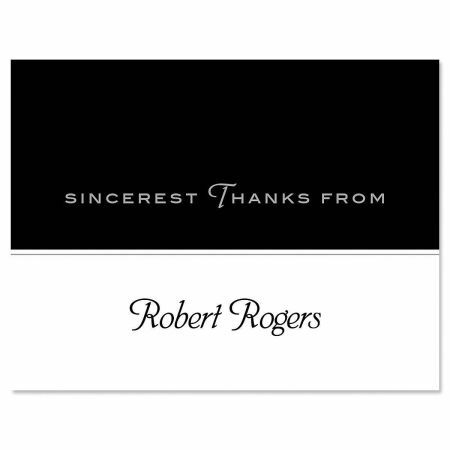 Important and more formal thank yous need the extra detailing our Black Rule note cards offer—black with gray border design, bold script personalization, crisp white card stock. 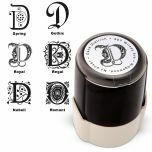 We dress up these note cards with the name or message you specify at no extra cost, so be sure to order a few sets for everyday thank yous too. Ideal for showing appreciation to the boss, your Congressman, your financial advisor, your professors, and anyone who deserves a special note of respect, our blank-inside thank you cards are 4 1/4" x 5 1/2" and come with white envelopes. Personalized cards come in a gift package. Specify 1 line up to 18 characters. "SINCEREST THANKS FROM" is preprinted.